We are one of the trusted suppliers of highly effective GT Capsules. These are triple fortified guguluthikhtam ghritam in soft gelatin capsules form used for treating major skin diseases and osteoporosis. 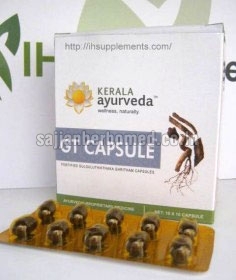 It is anti-infective, anti inflammatory and mild laxative. The formulation of GT Capsules is same as classical formulation of Guguluthikhtam Ghritam. We make available these GT Capsules in excellent quality medical-grade packaging. Dosage - 1 to 2 capsules twice daily or as directed by physician.